At 5 am, we were awakened from a sound sleep by the sound of shrieking loons - we tried to doze, but were again interrupted by constant splashing and scratching along the shoreline. We surmised it to be the muskrat that Steven had seen on the small island in front of our camp the previous evening. A raccoon would have attempted a raid of our food bag that was secured on a tree limb on the other side of the campsite. By 6:50 am, we had decamped and were preparing a quick-fix breakfast while enjoying the warmth of the campfire. Thick, milky fog engulfed the shadowed cove next to the cottage isle as the sun’s rays sneaked over the tree line, slowly burning off the purling mist. What a perfect way to start a day! Our original trip plan had us returning to Johnnie Lake by way of Clearsilver Lake; however, due to the length and number of portages involved, we opted to retrace our route via Balsam, Three Mile and Bell Lakes. It meant more appealing paddling and less hauling of equipment over harrowing terrain, especially the multi-contour-lined 830 m portage between Clearsilver and Johnnie Lakes. We skimmed across David Lake and into pillows of rising mist amongst the narrows and isles until we reached P9R665 (238 to 224), where the shoreline conifers were casting light green translucent reflections. The crossover up to the top of the ridge and the descent on the washboard trail to Balsam Lake was less of a challenge this time around – perhaps we were better prepared mentally and physically for the trek. 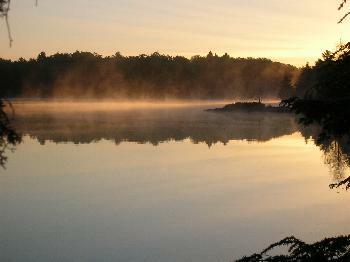 A glaring sun, reflecting off Balsam Lake, inhibited our navigation. In chaos of feathers, a young mallard combined paddling, waddling and flapping in order to cross the bow of our canoe. After padding through the serpentine marsh, most campsites were still occupied - the vacancy situation on David Lake had everyone scurrying to decamp. Their plans to hike up to Silver Peak later in the afternoon would ensure a long day for some. 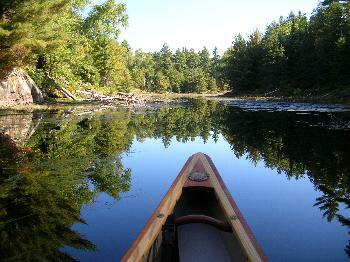 Two large otters were spotted swimming among the lily pads not more than fifteen feet from the canoe bow. Their movements were so purposeful and directed that we relinquished our paddles in order to drift closer. Their black eyes glanced towards us and their hind feet and tail were clearly visible under the water as they dove below the surface, taking refuge under the cover of the lily pads. After scanning the lake surface for some time, we finally located them resurfacing near the shoreline, crawling out of the water to disappear into the bush. At our approach to P10R30, the lake bottom held many stone sleepers visible only as the canoe passed over their mossy backs. The trolley was utilized to transport our equipment and canoe in one very simple and easy pass. With the right lighting, we took advantage of the opportunity to photograph some scenic landscape along the beaver stream until we reached the openness of Three Mile Lake. Strange pockets of stifling heat lay over the lake and to avoid their impact, we paddled in the shelter of cooler air along the shadowed shoreline. An osprey glided and circled overhead. A steady stroke of the paddle, estimated at 6 km per hour, had us arriving at Bell Lake in short order. A rock island in the middle of Bell Lake opposite campsite 81 enticed us to refresh ourselves with a swim. A blue sky filled with high, wispy white clouds had transformed the lake into symmetrical reflections. Suddenly, we heard women’s screams and shouts echo from campsite 86 – we assumed, from their vocabulary, that deer mice had invaded their campsite. At noon, we arrived at Bell Lake beach and again used the newer P11L300 (221 to 206) trail to transport our gear and canoe to the beaver dam on Johnnie Lake. 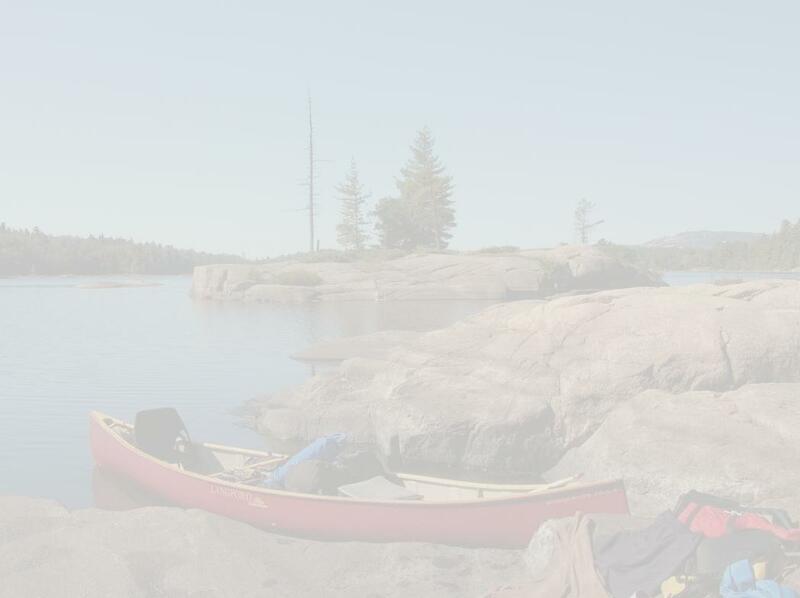 Five young canoeists were returning from a loop trip that included Bell, David, Great Mountain, Three Narrows, Killarney, and back to Bell Lake. Our group had tripped the Charleton - Great Mountain - Three Narrows loop in 2001, using Willisville as our entry and exit point. These five had good reason to be tired, having undertaken the massive 2945 m and 3160 m portages and several others - they were eager and deserving of a warm shower and a good greasy meal at the nearest take-out. 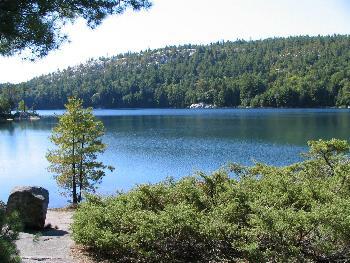 A beached canoe adjacent to a rock ledge came into view where two elderly artists with easels and pallets were intently painting a vista of the La Cloche Mountains. 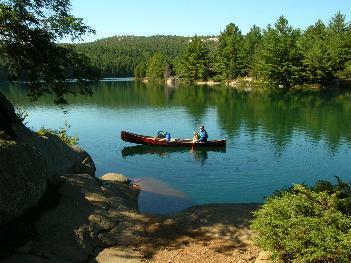 What a splendid way to spend a sunny afternoon in the confines of Killarney Provincial Park. On route to the portage, a two and half foot water snake, not bothered by our passing, was slithering across the lake’s surface. Along the shoreline, smooth round granite with patches of bright orange and green lichen, shone in the overhead sun. Formations of iridescent blue and red dragonflies patrolled the air space and in the distance, a lone hawk hovered near a swath of reeds, perhaps sighting its daily ration. P12L90 (206 to 214) was a simple carry over to Ruth Roy Lake; it was imperative to point the bow downward over a rock ledge to gently slip the canoe into the clear, aqua lake. A group of four young adults was in the process of departing the first campsite, as we continued on through a tree-stumped passage toward our destination. A reflective mural of a cumulus sky lay across the slick lake. With a gently dipped hand into the water, Norm easily shattered the firmament and a reflected image of himself. As predicted by the canoeist at campsite 65, we were not disappointed with campsite 73 and its surroundings. 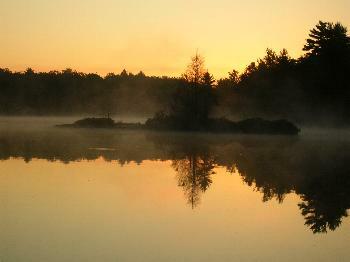 Ruth Roy Lake was considered a dead lake, without fish or plant life, except along some shoreline inlets. The campsite was located on a slab of granite that slanted downward to the shore and into the lake - in between, coniferous bushes acted as our draped clothesline. After we pitched camp, firewood was acquired from the woods across the lake and finally, a well-deserved swim and light lunch became our next priority. To pass the time, we played a game of cribbage with the makeshift cards; too stifling to play another game, we cooled off with another swim. One could dive down to the 15-20 foot lakebed where the clarity of the aqua water gave an appearance of swimming just under the lake’s surface. A scrumptious supper consisting of mashed potatoes and gravy, rice, veggies and topped off by a vanilla mousse dessert was consumed as we sat next to a driftwood campfire. A lazy sun dipped slowly beyond the fringe of the bluff across the lake, replaced by an incredible brilliant full moon. Its silvery beams shed over the lake surface, providing a day-like atmosphere and prominence to the landscape elevation. A star-studded sky shone like immense diamonds through the translucent night air. A warm breeze drifted into our campsite and the twilight gave a special tranquility, disturbed only by an occasional rustling of the pine needles overhead and the crackling of burning logs. We drifted into sleep with the distant hoot of an owl floating in the night air. Sometime during the middle of the night, the two of us became caught in a classic case of "diversion". It started when Norm heard some scratching and movement under the tarp next to the campfire. The critter was small considering the level of noise being made; however, the scurrying and scratching was impossible to ignore. Wayne was awakened and, being retired police officers, we decided to investigate. There was no evidence of foul play among our equipment so with a good kick and shake of the tarp, we returned to our tent. Half asleep, we again heard scratching, but this time along the tent walls as though something was trying to get in. Hitting the side of the tent a few times did not deter whatever was out there – the noise continued on one side of the tent and then the other. Without warning, Norm suddenly sprang up in his sleeping bag and yelled, "What the hell was that." Something had crawled up his arm and approached him face to face. Headlamp beams ablaze, the culprit was tracked down, scurrying about and totally scared out of its wits. Once the screen door was unzipped, a little deer mouse hightailed it without even acknowledging an "adieu". We laughed and thought what a tall tale the "little guy" was going to tell when he returned home to his partner after being out so late. We peacefully slept through the duration of the night.